18 pp. Roman, 663 pp. Nilo-Saharan is one of the four major language families on the African continent. It extends eastwards from the Niger to Western Ethiopia and further southwards to Northern Tanzania. While the status of Nilo-Saharan as a phylum has been largely accepted since Greenberg (1963), the internal classification has remained controversial. The present volume is intended as a decisive contribution towards the verification of the internal relationship of the Nilo-Saharan languages. Using regular sound correspondences for verifying levels of internal relationship was begun in the 1980s, but this work takes up the results achieved hitherto and continues from this basis. New sources are taken into consideration: apart from reconstructing consonants, vowels and tone, the study also includes derivational and inflectional morphology as well as pronouns. The book consists of two main parts. The first part (chapter 2-8) is dedicated to the reconstruction of consonants, vowels and tone, to the subclassification of Nilo-Saharan, verbal and nominal derivation, inflection and the pronominal system. The second part (chapter 9) is an etymological dictionary of 1,606 roots, complemented by annotations and reflexes of the roots in the particular languages. More than 10,000 roots are cited directly. The analysis of the first part (chapter 2-8) is based on the data arranged in chapter 9. 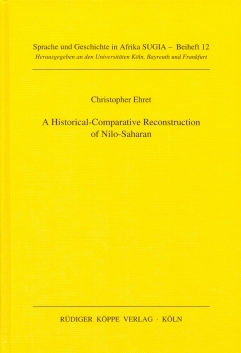 The most important result of Ehret’s work concerns the relationship of Songay in the Nilo-Saharan context. The author argues convincingly that Songhay should be regarded as an integral member of the Nilo-Saharan family. Connections with Mande must be seen as borrowings from Songhay into Mande. Furthermore, the established regular sound correspondences and the reconstructed Proto-Nilo-Saharan vocabulary allow for drawing up phonological histories of each language and distinguishing between loan versus long-term inherited words.